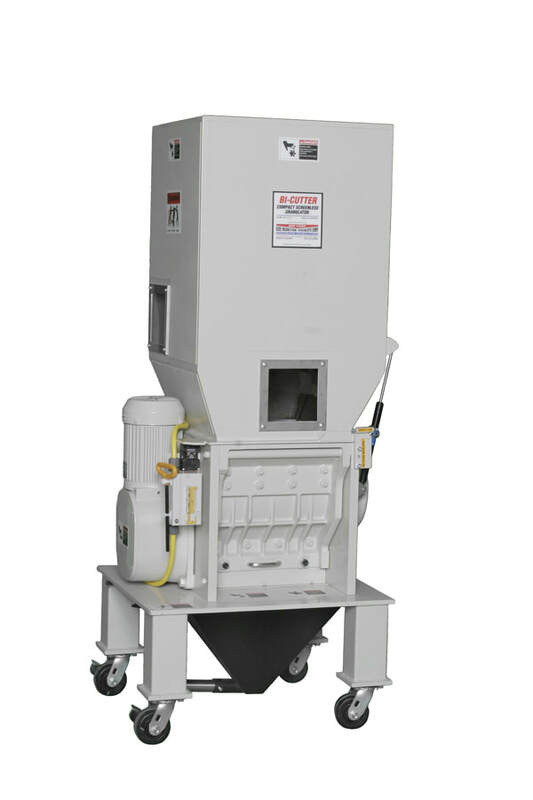 The uniquely designed two-stage Bi-Cutter screenless granulator produces excellent quality granules without the use of a sizing screen. A small, compact footprint allows the Bi-Cutter to be used press- side. Low RPM and horsepower allow the Bi-Cutter to be a low maintenance and low energy- consuming unit. The quiet, dependable Bi-Cutter cuts sprues/ runners into uniformly sized granules. The Bi-Cutter produces premium quality granules with no dust and guaranteed no longs. The first stage cutters rotate at a low rotation speed of 15 rpm. A special “S” shaped breaking blade in the first stage cuts the sprues/runners into smaller pieces, allowing the pieces to drop into the second stage cutting teeth. The second stage rotary and stationary cutters cut into uniform size at 45 rpm. The uniform particles then fall into the collector bin at the base of the Bi-Cutter for removal. 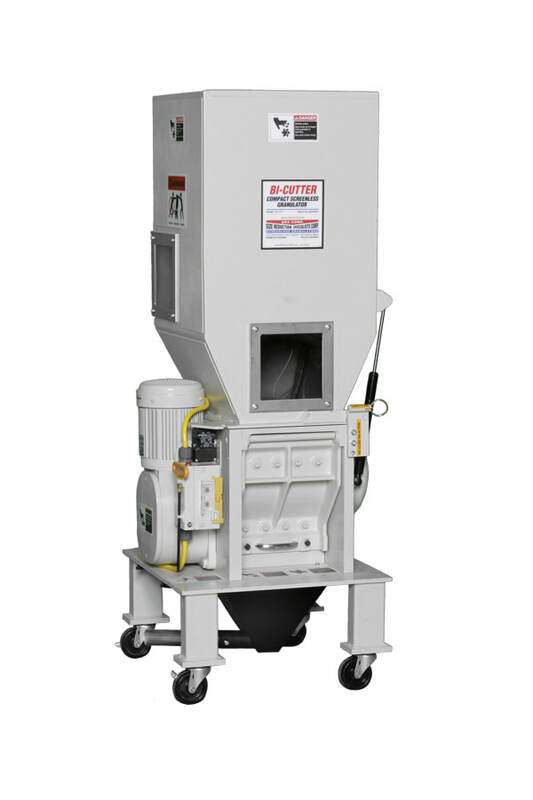 This press-side screen-less granulator will accommodate sprues and runners that have a measurement of less than 10" x 13" with presses of 250 tons or less. It produces a 6 x 6mm particle size and up to 35 pounds per hour*. Optional 3 x 5mm, 4 x 5mm, 5 x 6mm and 6 x 8mm cutters are available for this unit. Clean-out, maintenance and inspection is the easiest in the industry because of the swinging side-plates. 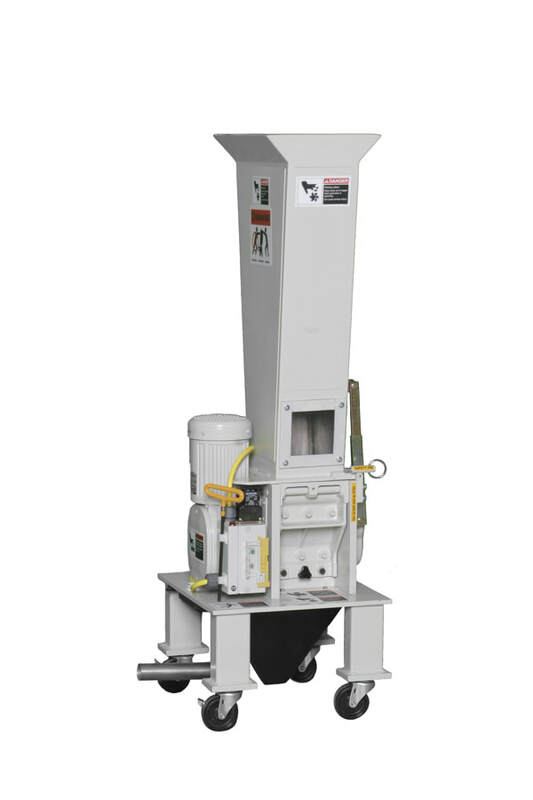 This press-side screen-less granulator will accommodate sprues and runners that have a measurement of less than 15" x 17" and thin-walled parts with presses of 500 tons or less. It produces a 6 x 6mm particle size and up to 65 pounds per hour*. Optional 4 x 5mm, 5 x 6mm, 6 x 8mm and 8 x 10mm cutters are available for this unit. Clean-out, maintenance and inspection is the easiest in the industry because of the swinging side-plates.